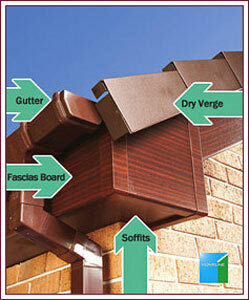 One of the key areas when installing a replacement roofline system is getting access to the roofline. This is the biggest variable and to get an accurate quotation a site visit is required. We have three means of access;ladders are used if safe to do so. the second is a very capable staging system, which the installers erect on site. This system does have some limitations though, as we cannot span existing structures such as conservatories or porches and there are several site restrictions that can affect its use. The alternative to our staging system is to erect scaffolding. Scaffolding allows access over existing structures and from difficult working areas. However when scaffolding is required it does have a big impact on the quotation, and we can illustrate these costs.